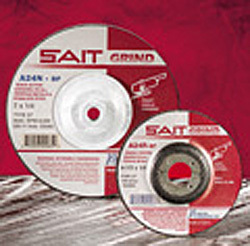 Sait Long Life A24R are United Abrasives most popular grinding wheels. Having a longer life requires fewer wheel changes. They are made of aluminum oxide, a course grain size and a medium hard bond making them suitable for general purpose grinding. Applications: Ferrous Metals such as iron, steel and welds. 9" diameter, 1/4" thick, Type 27 (depressed center), and a 7/8" bore, no hub. For right angle grinders.